In response to the outcry from mileage collectors frustrated by the lack of available award seats, the airlines are attempting to steer program members in the direction of flights that are good prospects for would-be award travelers. They’re doing this by listing destinations with plenty of empty seats (hot spots) and discounting award flights to lower-demand destinations. Oklahoma City in January? Why not? Founded by homesteaders in the 1889 “Oklahoma Land Run,” the city is steeped in history (check out the National Cowboy & Western Heritage Museum). And it’s the country’s 30th largest city. United is featuring award seats to Oklahoma City from both its Chicago and Los Angeles hubs. Got Alaska Mileage Plan miles? If so, you can redeem 15,000 miles for a round-trip or 7,500 miles for a one-way award trip between many cities in California and Canada, Idaho, Oregon, or Washington. That’s a 5,000-mile discount off the normal round-trip coach award price, and a 2,500-mile discount off the published one-way award price. The award discount is valid for travel through February 14. To take advantage of the discounted awards, bookings must be made online. For warm weather aficionados, Cancun, Mexico, is on the hot spots lists of both American and US Airways. 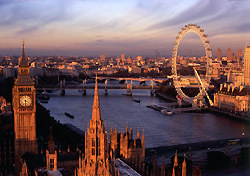 London has always been a favorite for award travel. This month, it’s a featured award destination on the lists of American, United, and US Airways. It’ll be a bit nippy, so bring your mac and brolly. And don’t underestimate the warming effects of a pint at the local pub. Finally, how about one of Asia’s most dynamic cities, and most exotic of this month’s recommended award destinations? Shanghai!